May 24-26, 1980, "The Year of the Coast"
Having little problem, then, scheduling this "beach backpack" with the local chapter, I gained some 7 participants for this Memorial Day weekend along this unique stretch of Northern California coastline. 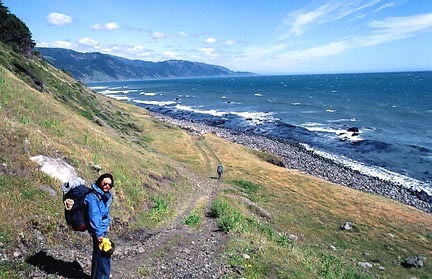 The Lost Coast, running some 25 miles, is a highly undeveloped length of coastline from the Mattole River at its north, to Shelter Cove, at its south. There are a few dirt tracks, with some shacks, but much of the rest is virgin beach. The area, currently part of the King Range National Conservation Area, is under consideration for wilderness designation by the BLM. We left after work, Friday the 23rd, to drive north on U.S. 101. I car-camped, with my single carpooler, at Standish-Hickey State Recreation Area. The next morning, driving past tracts of ancient forests, we left two vehicles at the beach parking lot at Shelter Cove. Reloading passengers, we took back roads, narrow and part dirt, to Petrolia, passing by highly rural sites with names like Honeydew. The weather was misting. This area claims to the most rainfall in California. Petrolia is also the site of the first oil drilling in this state. Driving to the primitive parking lot near the mouth of the Mattole River, we left the remaining cars and proceeded south on our three day backpack trip. There is nice, sandy beach to hike on for the first few miles. We came to a lighthouse ruin, Punta Gorda, and enjoyed the blooms of Mendocino Poppies along the way. Planning to go about ten miles this day, we found good campsites right away. 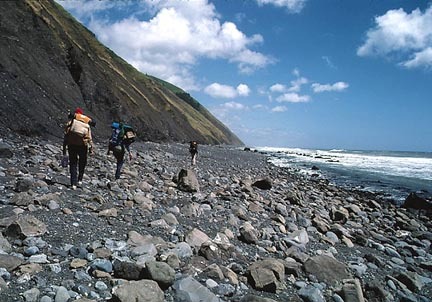 But, I chose to continue, and followed the eager group to call a halt at the mouth of Randall Creek. We had seen plenty of grazing sheep, so boiling your drinking water is very important. I had urged everyone to bring a frozen steak for a beach cookout using the plentiful amounts of driftwood. Only one other person did that. For me, it was a novel change from freeze-dried dinners, but I couldn't impress that on the mindless hordes who insisted on survival food. I had a cold Bud, and lit a small fire, using my lightweight camping grill, for my London Broil. It had thawed out nicely, while insulated by my pile jacket. This was perhaps one of the best steaks that I ever had (forgive me, vegans). The others had various freeze-dried meals, and hopefully enjoyed them. I spent some time on the grill, turning the piece of beef over. All I needed was a table and a candle for a luxurious time. On one other previous chapter trip, a similar food item was urged. Only, though, there was a high, cold wind, and the steaks became burnt on one side while still raw on the inside. And to add insult to injury, gritty sand was blown into the meat! Watch out for some local chapter cooking! I thought to do it right, on my own trips! I enjoyed this first night out. While sitting viewing the ocean, a sharp-eyed backpacker spotted a whale! Yes! I took a photo with a telephoto lens, but it is hard to spot in the photograph. We distinctly saw the spray from its blowhole as it quickly swam by about 200 yards from shore. A sunset over the tempestuous Pacific made my day. I took photos of anyone who wished themselves immortalized. I had to caution that one camper, who had set a tent up directly on the beach. The waves seemed to come closer and closer. There are such things as tides, and it did rise enough to cause this camper to move. I gave a warning on what to do in case of tidal waves. There is usually a sudden receding of the water just before the tsunami hits. The next day was overcast, but we continued on our walk south. We came to Big Meadow, where a family still lived. A dirt track through a fence was followed to a big creek and forested canyon. Some of us left packs to explore upstream of this most beautiful site. Douglas firs and shrubbery abounded. One person found a banana slug, then picked up a snake. There was a problem of fording the streams as we came to them. 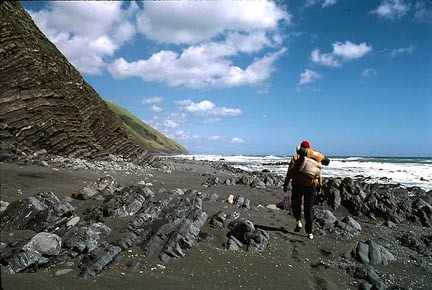 Agile rock-hopping, or making considerable detours to skirt less passable sections, was required. The dirt track led us on south. We called a halt at Shipman Creek, where someone had built a driftwood shack, which I claimed as my abode. The group had wandered along as each pleased, since it was hard to get lost, with the ocean next to you as your guide. One person failed to heed my directive to stop here, and camped alone, further down the beach. We wondered what had become of her, and one chief considered a search and rescue. I walked along a mile or two past our camp, but couldn't see her. Two of our group had camped along further, too, and I recall they said she just kept going--not hard to do while backpacking! The raccoons or some such small animals were heard scurrying about our camp that night. This was certainly great wildlife habitat! Our final morning, we ambled along to come to beach then currently used by dune buggies. We found our missing hiker, who was fine, and tended to by some other people. Young and full of energy, she was apparently testing her endurance. This portion, then open to motorized vehicles, was about six miles in length. 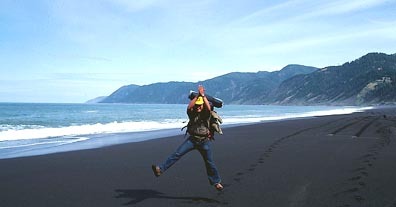 I believe it is called Black Sands Beach. A few dune buggies motored by. We shortly came to the beach parking at Shelter Cove, and opened our cars. The shuttle was arranged to take the drivers of the cars left at the Mattole River parking lot back, and I was free, for awhile, to enjoy a drive alone back to U.S. 101. I took a drive through the Avenue of the Giants, which was being enjoyed by the holiday crowds. It was magnificent! Meeting my one passenger in a prearranged town along 101, I ascertained that the shuttle had been completed and everyone was on their way home safely. I drove east on Highway 20 to our carpool point in Williams, CA, where I left this hiker to drive his way home. The weather had been cool, but pleasant for hiking. I heard that most everywhere else in California, it had been storming. But, we had lots of sunshine, and were barely touched by precipitation. I always planned to do this again, but never had any more takers. Other chapter trips were scheduled in later years, but I haven't heard of any of them doing the full traverse. This marked the most different weekend trip, rather than the usual peak climbs, that I had ever led. Everything has probably now changed, so it would be nice to make a return trip sometime.